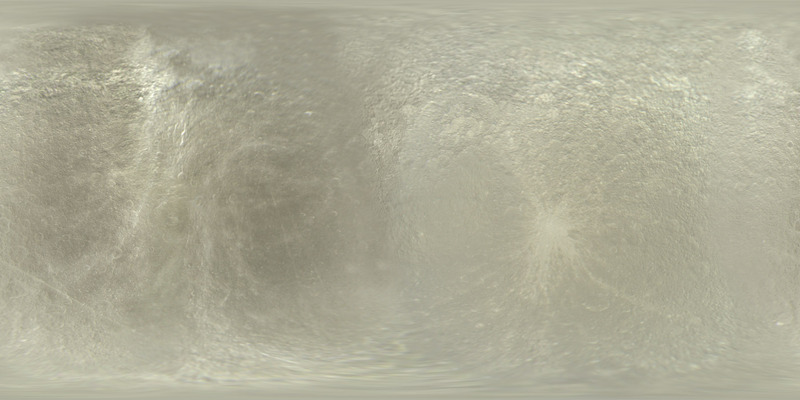 This map of Rhea was constructed from eight pairs of RGB composites obtained by the Cassini spacecraft, meaning a total of 24 images was used. All of the images were low-phase global views. This map is unusual because the goal was to create a map showing albedo and color variations as opposed to topography and/or shadows. To achieve this I used Photoshop to make considerable manual modifications to the map. This mainly involved removing the shadows that were present in the original data. This makes the map suitable for use in conjunction with a DEM (see the experimental renderings page) or for making very low-phase renderings but also means that the map is not as accurate as most of the other maps at my website. The available color coverage isn't completely global so most of the data north of 60°N is fictional although the large scale albedo variations there might be approximately correct. Click the map below to download the full size map (1800x900 pixels). The map is in simple cylindrical projection with latitudes running with a uniform interval from -90 (bottom) to 90 (top) and longitude 0 at the left edge of the map. It should be rendered by projecting it onto a sphere of 764 km radius or some equivalent unit. See also my planetery rendering tips page for further info. For ultimate accuracy use a triaxial ellipsoid with a Saturn-facing radius of 767.2 km, polar radius of 763.1 km and orbit-facing radius of 762.5 km.